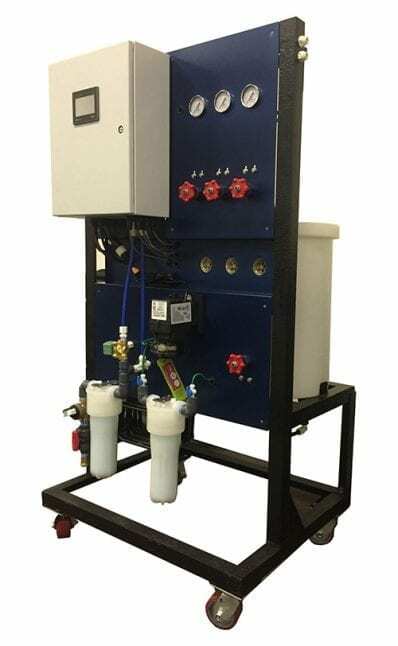 Generadores de mezclas oxidantes - ChlorKing, Inc.
MIO-GEN generators are available in many sizes and configurations to suit any application and are capable of producing up to 2.4gpm of solution. Anolyte – produced with a pH of 2-4, free chlorine of 500 – 700ppm and an ORP of 950mv, this solution is a very effective sanitizer and multipurpose cleaner. Catholyte – produced with a pH of 11 – 12.5, caustic soda solution and an ORP of -950mv, this solution is very effective as a degreaser and surface cleaner and has very unique properties when used as a carpet cleaner. N.E.W (neutral electrolyzed water) – produced with a pH of 7 – 7.5, free chlorine of 500 – 700ppm and an ORP of 950mv, this solution is used in potable water treatment, bio-film removal in circulation piping and bacteria removal in storage tanks. N.E.W is fastly becoming one of the most sort after solutions in many industries and the true potential of this solution is still being discovered. Contact us today for more information and ordering.